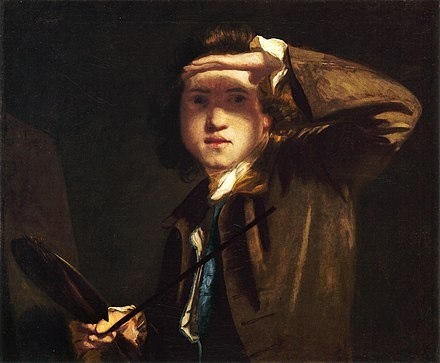 Sir Joshua Reynolds was an English painter, specialising in portraits. John Russell said he was one of the major European painters of the 18th century. He promoted the "Grand Style" in painting which depended on idealization of the imperfect. He was a founder and first president of the Royal Academy of Arts, and was knighted by George III in 1769. In 2018, the 250th anniversary of the founding of the Royal Academy of Arts in London, UK was celebrated. Francis Hayman was an English painter and illustrator who became one of the founding members of the Royal Academy in 1768, and later its first librarian. William Shipley was an English drawing master, social reformer and inventor who, in 1754, founded an arts society in London that became The Royal Society of Arts, or Royal Society for the encouragement of Arts, Manufactures & Commerce (RSA). Sir William Chambers was a Scottish-Swedish architect, based in London. Among his best-known works are Somerset House, London, and the pagoda at Kew. Chambers was a founder member of the Royal Academy. 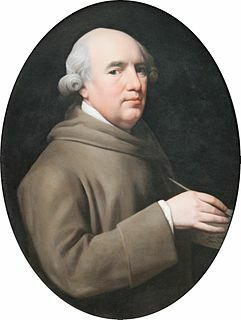 James Paine (1717–1789) was an English architect. 1 2 3 Taylor, Brandon (22 April 1999). Art for the Nation: Exhibitions and the London Public, 1747–2001. Manchester: Manchester University Press. ISBN 9780719054532. ↑ "Incorporated Society of Artists of Great Britain". Royal Academy of Arts . Retrieved 26 April 2014. 1 2 3 Smith, Charles Saumarez (2012). The Company of Artists: The Origins of the Royal Academy of Arts in London. London: Modern Art Press. pp. 31–31. ISBN 1408182106. Graves, Algernon, ed. (1907). The Society of Artists of Great Britain, 1760–1791 and the Free Society of Artists, 1761–1783: a Complete Dictionary of Contributors and their Work from the Foundation of the Societies to 1791. London: G. Bell and Sons. Algernon Graves was a British art historian and art dealer, who specialised in the documentation of the exhibition and sale of works of art. He created reference sources that began the modern discipline of provenance research. Robert Adam was a Scottish neoclassical architect, interior designer and furniture designer. He was the son of William Adam (1689–1748), Scotland's foremost architect of the time, and trained under him. With his older brother John, Robert took on the family business, which included lucrative work for the Board of Ordnance, after William's death. James Barry was an Irish painter, best remembered for his six-part series of paintings entitled The Progress of Human Culture in the Great Room of the Royal Society of Arts in London. Because of his determination to create art according to his own principles rather than those of his patrons, he is also noted for being one of the earliest romantic painters working in Britain, though as an artist few rated him highly until the fully comprehensive 1983 exhibition at the Tate Gallery led to a reassessment of this "notoriously belligerent personality", who emerges as one of the most important Irish Neoclassical artists. He was also a profound influence on William Blake. The first modern public exhibition took place in London during 1756, when the recently established Royal Society for the Encouragement of Arts, Manufactures and Commerce held the first in a series of fine art exhibitions. Prizes were offered for improvements in the manufacture of tapestry, carpets and porcelain, and winners were chosen from a competition of submitted articles. The show was open to society members and their friends. The society was more concerned with quicker production and more efficient implements than with artistic expression. Awards were given to young students for such practical things as planting oak trees for the English navy and dyeing textiles. There were 130 paintings by 69 painters in the exhibition, including artists such as Joshua Reynolds, Benjamin Wilson, Richard Cosway and Louis-François Roubiliac. John Raphael Smith was an English painter and mezzotinter, son of Thomas Smith of Derby, the landscape painter, and father of John Rubens Smith, a painter who emigrated to the United States. Tilly Kettle (1735–1786) was a portrait painter and the first prominent English portrait painter to operate in India. Thomas Jones was a Welsh landscape painter. He was a pupil of Richard Wilson and was best known in his lifetime as a painter of Welsh and Italian landscapes in the style of his master. However, Jones's reputation grew in the 20th century when more unconventional works by him, not originally intended for exhibition, came to light. Most notable among these is a series of views of Naples which he painted from 1782 to 1783. By breaking with the conventions of classical landscape painting in favour of direct observation, they look forward to the work of Camille Corot and the Barbizon School in the 19th century. His autobiography, Memoirs of Thomas Jones of Penkerrig, went unpublished until 1951 but is now recognised as an important source of information on the 18th-century art world. Jeremiah Meyer was an 18th-century English miniature painter. He was Painter in Miniatures to Queen Charlotte, Painter in Enamels to King George III and was one of the founder members of the Royal Academy. William Pars was an English watercolour portrait and landscape painter, draughtsman and illustrator. Peter (Pierre-Etienne) Falconet (1741–1791) was a French portrait painter. Francis Milner Newton was an English portrait painter and first secretary of the Royal Academy. Peter Mazell was an Irish painter and engraver, working in London between c. 1761 and 1797. He is known for his fine engravings of natural history subjects, especially those illustrating books by John Walcott and the Welsh naturalist Thomas Pennant. He created almost 600 engravings in his career. He also exhibited paintings of landscapes and of flowers. He exhibited at the Society of Artists and at the Royal Academy. James Paine the younger (1745–1829) was an English sculptor, known also as an architect and artist.